The orbit is the bony socket that contains and protects the eyeball and allows for the optic nerve to pass from the eye to the brain. The orbital region includes the surrounding bone and the muscles that control the eye, as well as nerves and blood vessels. Tumors may arise from any of these structures, but neurological surgeons primarily treat those of neural origin, which are the most common tumors of the orbit. Orbital tumors may arise from Schwann cells, cells in the sheaths that cover nerves. These usually benign tumors, called neurofibromas and schwannomas, can occur on any nerve in the area except the optic nerves, which lack Schwann cells. Another relatively common benign neurological tumor in this area is the optic glioma, a tumor that arises from glial cells, the supporting cells in the brain, which also are found in the optic nerve. Another tumor is the orbital meningioma, which comes from the meninges, the protective covering that surrounds the brain and optic nerves. These tumors may arise within the orbit, or may develop outside the orbit and grow to include it. Other tumors that occur in and around the orbit include osteomas and ossifying fibromas, which involve bone; hemangiomas and lymphangiomas, which come from the vascular system; rhabdomyosarcoma and fibrous histiocytoma, which arise from developmental cells; skin cancers on the eyelids; and metastatic tumors that spread to the area from other parts of the body. The most common presenting symptom of an orbital tumor is exophthalmos, also called proptosis, the protrusion of the eye. Tumors that involve neural structures, such as schwannomas, optic gliomas, and orbital meningiomas, usually will cause profound visual problems, including double vision and vision loss. Tumors that do not involve neural structures cause milder visual problems by compressing the optic nerves. Tumors in this region also may cause pain or a feeling of pressure in the eye socket. As with most brain tumors, imaging studies are essential to diagnosis of tumors of the orbit. Both magnetic resonance imaging (MRI) and computed tomography (CT) scans can be used. In general, MRI scans are preferred because they provide clear images of the structures within the orbit. For either study, an agent that provides contrast in the image is administered intravenously so neurosurgeons can visualize the tumor against the normal tissue in the background. In addition, a biopsy also may be conducted so the tumor tissue can be examined under a microscope to provide a definitive diagnosis. Most neurological tumors in this region are benign, so if a tumor is small and does not cause symptoms, it may be observed without treatment. If, however, the tumor causes disfiguring exophthalmos or begins to cause visual symptoms, surgical removal is the best treatment option. For benign tumors, surgery usually will provide a cure. For rare malignant tumors, surgery may be followed by radiation and chemotherapy. In addition, stereotactic radiosurgery, which involves the use of a highly focused beam of radiation to target the cancer cells, may be used as an adjunct to surgery. 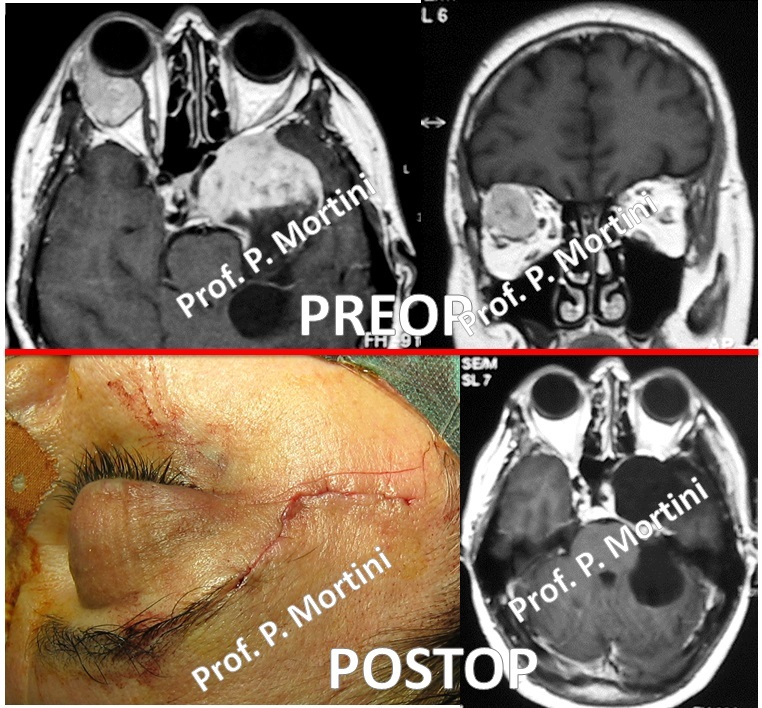 Surgery of orbital tumors is usually carried out by a team of neurosurgeons and neurophalmologist.